Lord help me, I've been reciting the Serenity Prayer in my head ad nauseum... let's hope between that and the intelligent prose of Ralph Waldo Emerson, I shall get through another quote Tuesday. Hope you're all enjoying a good day. If not, get back to me, and we shall plan a time and meeting place to let out our aggressions on our childhood stuffies....xo. My little Zoe is having a rough few days. She's been throwing up since last Thursday, and her appetite has been down (normally she's such a little oinker I'm afraid Bosco won't get his fair share). After watching her go through that the entire weekend and cleaning up way more than a fair share of cat barf, Chris took her to the vet yesterday. Of course, prior to that I attempted to get my answers via Dr. Google (read: very bad, very, very bad idea). I was worried sick, and was a teary-eyed pathetic MESS Sunday night and all Monday. The vet didn't want to jump to any conclusions until she ran some tests so on Monday they took blood and did a full work up. In addition she declared that Zoe had a substantial heart murmur (a 3-4 on their scale of 6, and 6 being the most worrisome), and a low-grade fever. Fortunately, the blood work came back clear, but there was still no determination as to what was causing her to be so sick, so an x-ray was booked to see if there was a blockage. She went back today for an x-ray; there was a small spot where the vet thought there could be a blockage, but it wasn't something she wanted to 'open her up for'. She was given an enema which didn't really result in a large anything, and she was given an anti-puke pill which she promptly puked up. The vet left instructions to continue force-feeding her the anti-hairball paste (which, up til now, she liked and readily took, but now, apparently loathes), and advised they'd like to have her back in again today for another x-ray to see if the blockage moved. I'm so completely worried sick about her I don't even know what to do with myself. 10 years ago today I had the day off from work. I was settled in my apartment on the couch in front of the tv, watching TLC. I was glued to either "A Dating Story", or "A Wedding Story", when the phone rang. It was Tanya, my roommate. I think she asked me what I was doing and I advised I was chilling in front of a little TLC. The next words she said are as vivid as if she'd said them today, "Amber, you have to turn the channel....you have to turn on the news...". September 11, 2001 will be forever marked in everyone's minds and hearts. 10 years later, Ground Zero is no longer a place of wreckage, of scars. A memorial was opened to commemorate the victims of the tragedy. 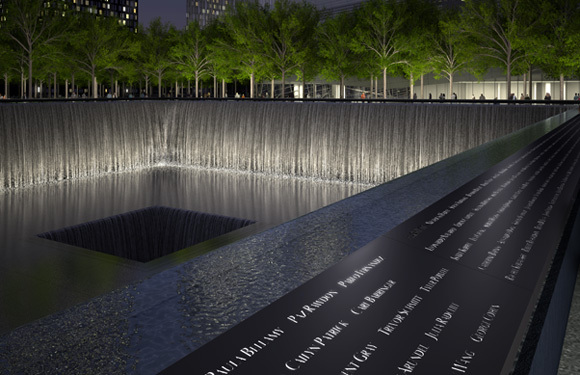 Where the two towers once stood, now are two square memorial pools, each adorned with the names of victims, amid trees to signify resurgence and regrowth. A lone tree that was adorned the "Survivor tree", after it had remained standing after the attacks, being one of them. Today there's a memorial service including a moment of silence at the times of the planes hitting, and the times the towers fell. The names of all of the victims being read aloud by members' of their families. Family members gather around the memorial pools, finding the name of their loved ones. They say a prayer; some take photos; some take pencil rubbings of the names; some leave flowers. I sit today, again glued to the tv in front of me, as I was 10 years ago. Again, tears streaming down my face. I shall never forget September 11. I'm coming back to you all. I swear. Soon!